On November 6, 2005, I attended the opening reception for a new exhibit at the Berkeley Art Center, a city-sponsored gallery in Live Oak Park. The exhibit was called Justice Matters: Artists Consider Palestine, and purported to "address current contemporary issues of occupation and colonization within Palestine." 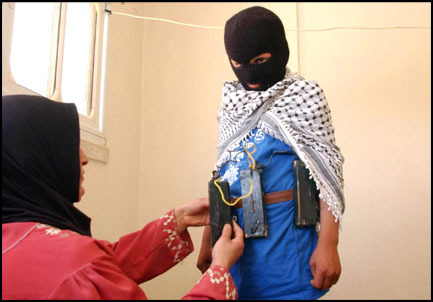 Here's a close-up of the central figure, with the bomb attached to his waist more clearly visible (which is reminiscent of this photograph of a young Palestinian being groomed to become a suicide bomber). Next up was this photograph of two mannequin-hands holding a "blood"-soaked globe. You might wonder: what does this have to do with Palestine or Israel? The answer: everything. 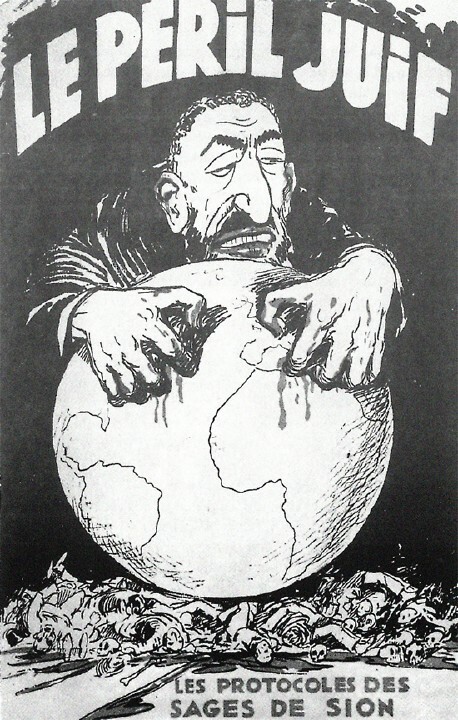 Because the image of greedy hands grasping a (frequently bloody) globe is one of the most notorious anti-Semitic illustrative themes of the last century. This motif was (and is) often used as an illustration for covers of the anti-Semitic tract The Protocols of the Learned Elders of Zion. No matter. The citizens of Berkeley, imagining themselves to be ever-so-tolerant, blithely strolled around the gallery, murmuring appreciatively about the art. This satirical piece is intended to look like an oversized package containing a children's toy Caterpillar bulldozer -- reimagined as "Caterrorpillar." Pro-Palestinian activists in the United States have targeted the Caterpillar corporation for a boycott because in the past Israel used Caterpillar-brand equipment to demolish the homes of suicide bombers in the West Bank and to knock down buildings that are used for weapons smuggling and sniper outposts in Gaza. The boycott has been decidedly unsuccessful. Near the front door was a large collage-style work featuring the words "PIECE NOW!" ("piece" is slang for "gun") on a semi-automatic rifle, above a banner that says "Human Potential as Human Ammunition," an apparent laudatory reference to suicide bombing. On the other side was this piece, entitled "It's a Good Day to Die." Since this was an opening reception, snacks and drinks were provided -- including cans of Salaam Cola, printed with the slogan "Eid Mubarak" (which is the greeting used to mark the end of the recently concluded Ramadan). I sipped a can while watching a video (set up by the curators) about Palestinian gangsta rappers, advertising a film called Slingshot Hiphop. Moving right along, I came to this rather odd pencil drawing of what looks like a weapon-toting Transformer robot emerging from a floral decoration. Next was the Pop Art "Tribute to Edward Said," featuring a Said quote about the racism of Europeans above a Palestinian tied to a chair and a fat white man playing a piano. Interpretation: unknown. Berkeley's city government was represented at the event by City Councilmember Dona Spring who showed up to browse the art. Here's the list of artists. If you want to know which artist created which work, you'll have to visit the exhibit yourself: it runs through December 17, 2005 (Wednesday-Sunday, 12-5pm; 1275 Walnut St.; admission free). Here is an interpretation of some of the works (including the Said tribute). Notice in particular the final paragraph, which is a sort of literary fantasy of the eventual Palestinian victory in the struggle. I especially like the phrase, "The globe will be cradled in the guts of young men who can't hide their smiles," which I read as a paean to the "martyrs" who blow themselves up for the cause. An adjacent sign explained a bit more about the political outlook of the curators. From what I could discover, The Berkeley Art Center merely provided the gallery space, whereas the Middle East Children's Alliance acquired the art for the exhibit. The Berkeley Art Center is nestled in the trees of the city-owned Live Oak Park.